Home Unlabelled A Casual labourer’s mixed bag of quadru-blessing! Lucy Wangari Murigi (centre) is franked by Gaichanjiru Medical Superintendent Dr. Pius Opendi (extreme left) and Ahadi Kenya Trust Director Dr. Stanley Kamau (right) after a successful delivery of quadruplets. A middle-aged woman has given birth to quadruplets at Gaichanjiru Mission Hospital of Kandara Constituency in Murang’a County. With a big smile on her face, Lucy Wangari Murigi said that she was both shocked and overwhelmed with joy from her bundle of surprise as she was just expecting one child as a second born in her family of three only to be blessed with quadruplets; three girls and one boy after a successful caesarian section. The situation was not any different for her husband Samuel Murigi who could not comprehend what to do. Murigi is a casual labourer at Kariti village. “I was expecting only one baby as a second born but when the doctor broke the news of the quadruplets, I initially stayed in a state of denial before I could come to terms with reality,” said the husband amidst stammering scratching his head severally. Murigi, who is now a father to five, is now appealing for help from well-wishers saying as a casual laborer, it will be taxing for him to bring up the quadruples. She reckoned that it will be a tall order for the family to feed the four babies with breast milk which is an expensive affair. 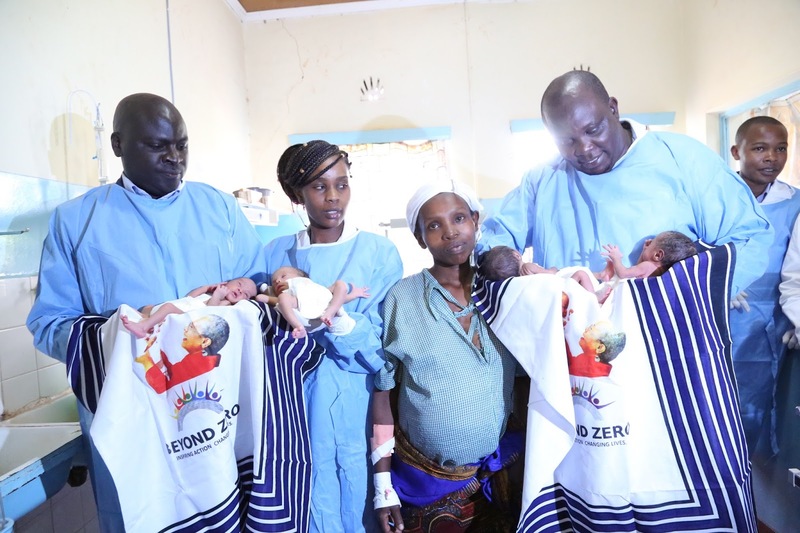 Gaichanjiru Medical Superintendent Dr. Pius Opendi said that all the four babies were in good health despite being underweight, a factor that had necessitated them be placed in incubators. Dr. Opendi however expressed the hospital management’s concern about the health of the four babies considering the fact that the mother was operated on the 34th week of gestation instead of the normal 39 weeks. He added that they had organised a special programme for the mother and her babies where a nurse will be visiting them for a follow-up until the babies will be of age. He acknowledged that the hospital had seen over 400 babies being delivered through the Linda Mama programme. Kandara Assistant County Commissioner Mr. Joshua Okello, lauded the programme saying it has reduced the number of home deliveries. He added that they had done a lot of sensitisation in the area, thus reducing the number of home deliveries. Ahadi Kenya Trust Director Dr. Stanley Kamau who visited Lucy and her babies in the hospital offered to employ a nanny who will look after the children for one year. He also donated some money to the couple for purchase of formula milk for the babies. Dr. Kamau further sent an emissary from his office to assess the family’s habitation to ensure that his organisation put up a more conducive house for the young family. He added that Ahadi Kenya Trust will take part in complementing the government by offering support to such programmes.